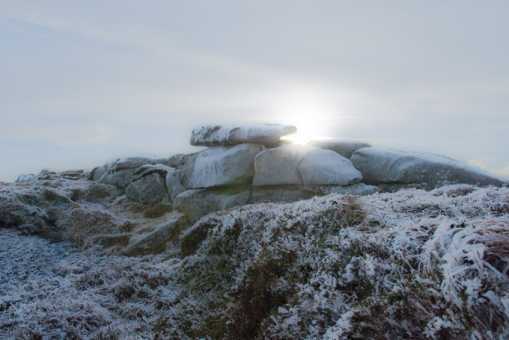 The cheerless winter sunshine behind the granite tor that gives its name to Carrigvore (Carraig Mhór) may not look very inviting, but the tingling, icy conditions of the last few weeks have created some of the best walking conditions I can remember along the ridge that extends from here, by way of Gravale and Duff Hill, to Mullacleevaun East. The hard hand of Jack Frost has even turned the notorious peaty trenches around Gravale into dazzling crusty avenues of access. The problem with this walk is, of course, its linearity. Unless you can arrange another car at the end, there is little alternative but to retrace your steps to Carrigvore. The possibility of dropping down to the roughly parallel Military Road, as suggested in another comment, is a brave attempt at circularity, but I’m not sure it is one that appeals very greatly to weary feet shod in stiff mountain boots.